Types of painting easels : Whats the best one to buy and whats the difference? There are so many types of easels out on the market these days. Big, small, with wheels, without wheels, various alphabet-lettered frames and that’s not even touching on the types of wood! It can be a little overwhelming and difficult to decipher which one is best suited to you. Finding the right easel to buy is like finding a comfortable fitting pair of shoes so let us be your Prince Charming and find your Cinderella fit. With a clear breakdown of each one we promise, it’s easel-y done! Let’s begin with the most common A-Frame Easel, also sometimes referred to as a Lyre Easel. 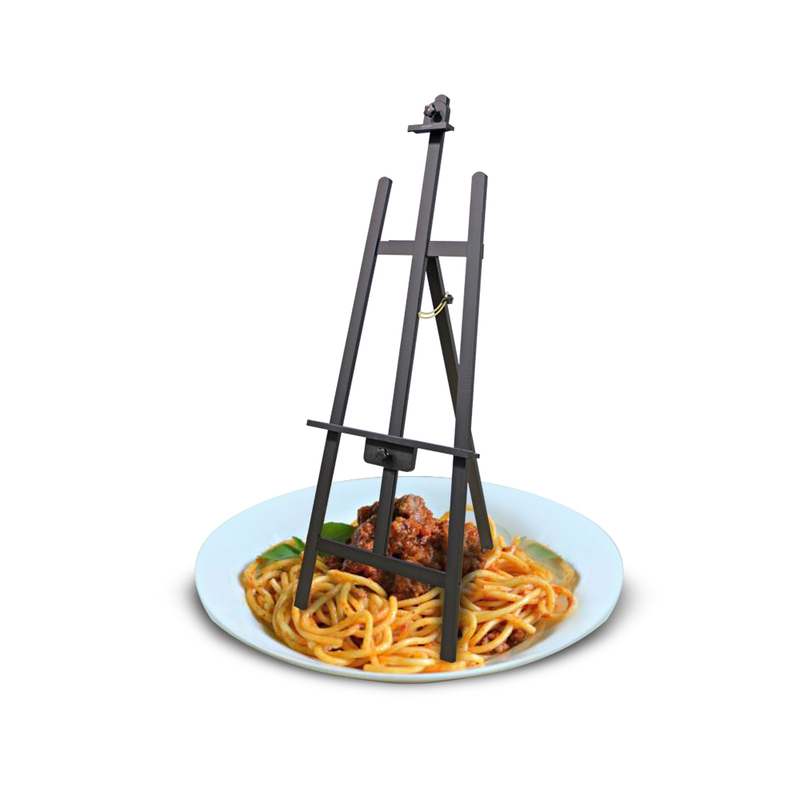 This easel is like a classic spaghetti bolognaise; simple, practical and it gets the job done. It gets its name from its triangle A-shaped frame that consists of 3 legs, two in the front and one in the back. This shape sits comfortably on the floor and its ledge holds canvases of many shapes and sizes up to 160cm high. This isn’t the sturdiest of all the easels, however, its most desirable feature is the way it can be compactly stored away. Its rear leg folds in for flat storage or can be hung flush on the wall. The A-Frame is adjustable so can be modified to suit a range of heights. A great all-rounder for artists of all skill levels. Being H-shaped, the backing frame has two support columns on either side and a wide ledge that holds not only your canvas but has ample room for brushes and materials too. The backing frame also has a central column for added support that can hold canvas up to 120cm high. The whole apparatus sits atop a solid square-shaped frame and can often be fitted with lockable wheels for easy gliding. The base of this easel can often fold flat, however, it is the bulkier option compared to that of an A-Frame. If you are an artist with a dedicated workspace or studio this easel is well worth the investment. The most sophisticated and charming of them all – The French Box Easel. 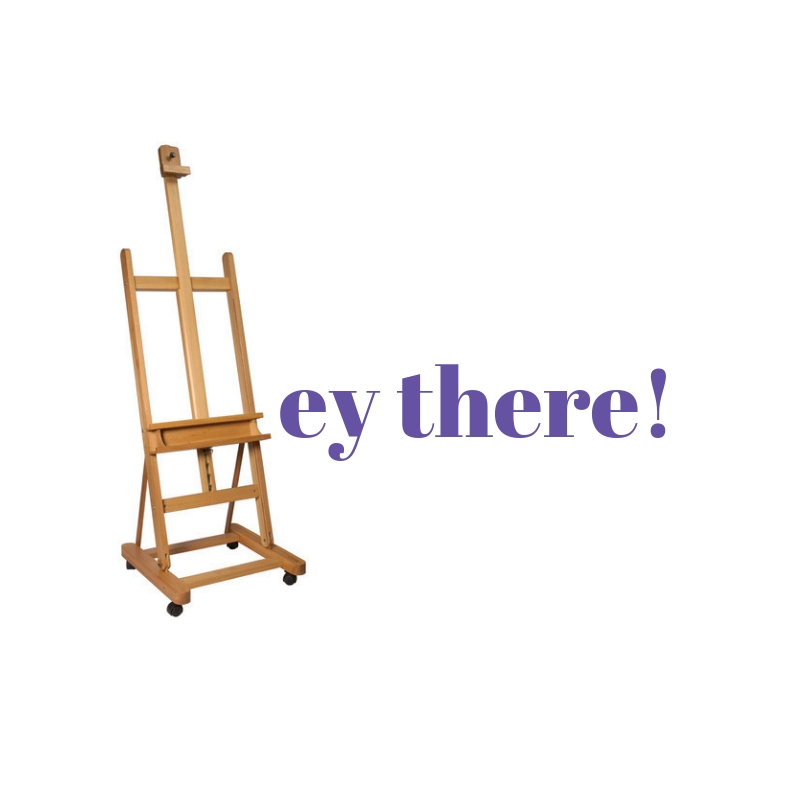 This easel is not only ultra-functional but has that certain ‘Je ne sais quoi’ that makes so many go ‘Ooh la la’. Made from solid but lightweight woods such as bamboo and beech wood, this is the ideal easel for painters who like to take the studio outdoors and is a favourite among many plein air landscape artists. This easel is a complete studio in one; it acts not only as an easel but also has a spacious drawer built in for holding your art supplies and better yet, all folds up into a handy suitcase size that can be carried from place to place; perfect for the nomadic artist. This stunning piece of French engineering will serve you for many years to come and become your own travelling art companion. So French! So chic! 188cm in height. Holds canvas up to 90cm. 188cm in height. Holds canvas up to 85cm. 3. They are a streamlined, elegant design that makes them not only great for working on but also displaying works in a retail space, studio viewing or art show. Granted the Tripod Easel is not the sturdiest of them but what it lacks in strength it makes up for in convenience. It can be erected with just a few leg extensions and is lightweight for super easy transport. Its thin frame fits in even the smallest of studios so is great if you’re a little tight on space plus if used for displaying purposes the dainty design is very stylish and doesn’t overwhelm or detract from the artwork itself. Another added benefit to the Tripod is its price. They are one of the more affordable ones in the easel range so if you’re looking save some cash don’t need anything too hardy definitely give this one a try! 180cm in height. Holds canvas up to 92cm. 185cm in height. Holds canvas up to 90cm. 180cm in height. Holds canvas up to 70cm. 200cm in height. Can hold canvas up to 73cm. 226cm in height. Holds canvas up to 132cm. Next up, the Giant Easel, because sometimes bigger is better! Aptly named, this easel is for the artist who likes to work on a larger scale. Its large size does, however, make this easel a pretty permanent fixture in your studio space as its slightly bulkier and heavier make up makes for more difficult to transport than others. If you’re an artist that’s looking to create some vast masterpieces and space is not an issue then this easel is well worth the investment! Its robust frame is hard-wearing and will last you for years to come. 270cm in height. Holds canvas up to 205cm. For the artist who likes to change it up. Convertible Easels also referred to as Hybrid Easels, have a tilting mechanism that adjusts to a range of different angles all the way down to a flat tabletop position for horizontal work. This easel is perfectly suited to artists who work in a range of different media. For example, acrylic and oil works need an upright canvas whilst watercolour and pastel pieces are better done on a horizontal flat surface. The versatility and flexibility of this easel will make you a total convert! 223cm in height. Can hold canvas up to 152cm. 388cm in height. Holds canvas up to 207cm. This convenient easel can convert your dining table to art studio and back all in time for dinner. These compact easels for perfect for the artist that works on a smaller scale and is short on space. They are easily packed away and transported for on-the-go artwork plus, many include a handy built-in drawer for storing art supplies and materials. Like their larger counterparts, they come in a range of different designs just made pint-sized, including French Box-Style, Tripod, H-Frame and A-Frame. 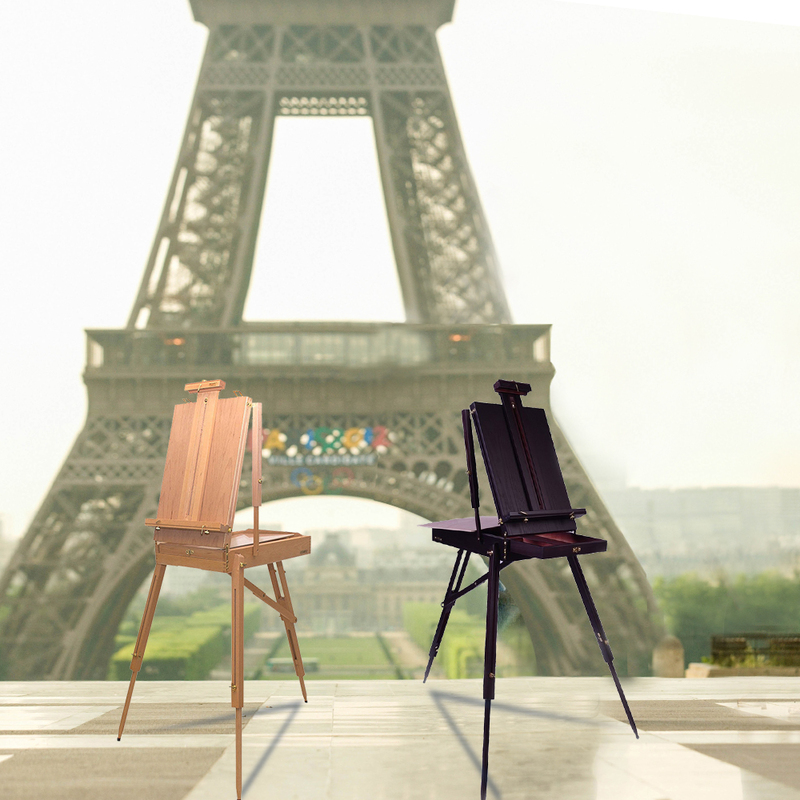 These easels make for a transportable studio carried anywhere your creative work may take you. Also, make for stylish display stands for exhibiting work. This baby is the Rolls Royce of workstations. The deluxe design is not only ultra-stylish but incredibly functional and has the benefits of a variety of easels all rolled into one sleek, matte black package. Its steel base construction is sturdy and stable and its tempered glass top has a tilt range of 60 degrees that adapts to vertical and horizontal positions for a variety of different works. Fitted with iron mesh drawers, accessory tray and built-in studio tidy for holding pens, brushes and other materials this station is not short on storage and keeps every tool at your fingertips. Its wide feet make for great stability and are fitted with rubber bottoms to protect your studio floor. Its glass top enables light to shine through for tracing or drafting work. Suited to a range of different work and artists, this creative station is a professional-grade, high-quality design that’s built to last. There you have it! A go-to guide for picking the correct easel for you. In the end, there are many great easels and the best easel is the one that suits your budget, style of painting and the space you have to work in. If you have any further questions don’t hesitate to contact our helpful team or visit us in store. If you have any topics you’d like to learn more about drop us a line with some blog suggestions. Plus, don’t forget you can watch video tutorials on our YouTube channel https://www.youtube.com/user/artshedonline. Happy creating!